Hello Autumn... It's one of my favorite times of the year as I just love the colors, the holidays, the changes, the hot drinks and I adore the fall fashion, especially wearing boots. I thought a fall set up and layout would be perfect for my Petite Prints project in my brand new Doodlebug 'Mint Daily Doodles Travel Planner'. 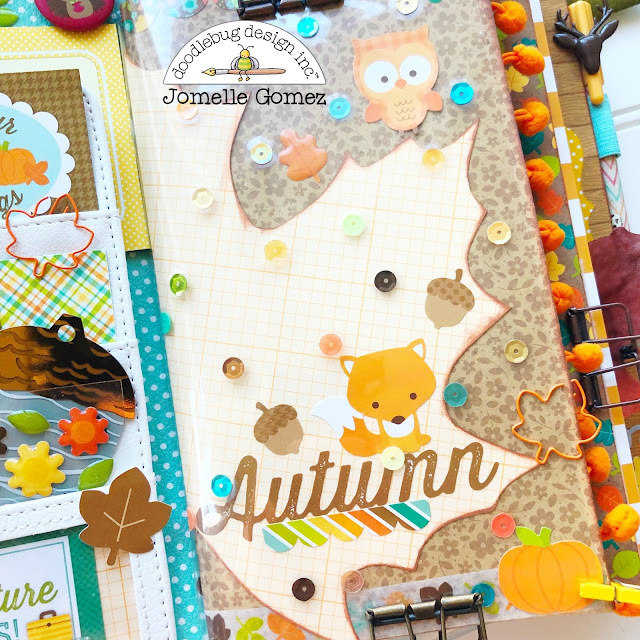 I used the kraft floral graph petite prints and cut it into the size of the standard insert to create my cover. 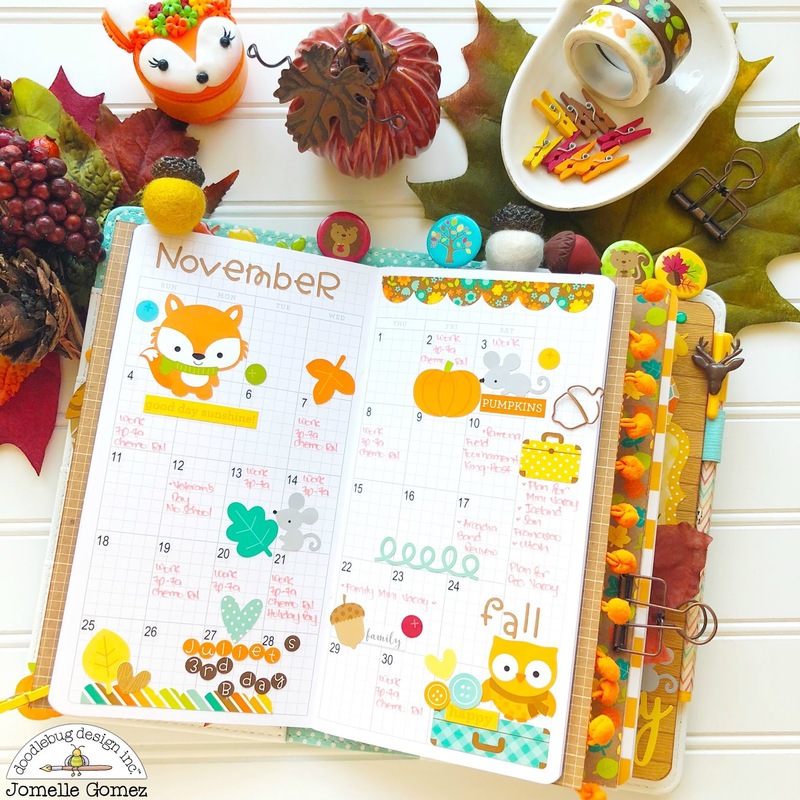 I traced the fall leaf decor-the one you see on the top right corner in the picture below (I got the leaf at Michael's) using the lemon floral graph petite prints paper and I fussy cut it. After I finished cutting, I folded it in half and I placed it on the insert cover so that half of the leaf will show on the front and the half will show on the back. I inked the edges with brown chalk ink to finish the look. 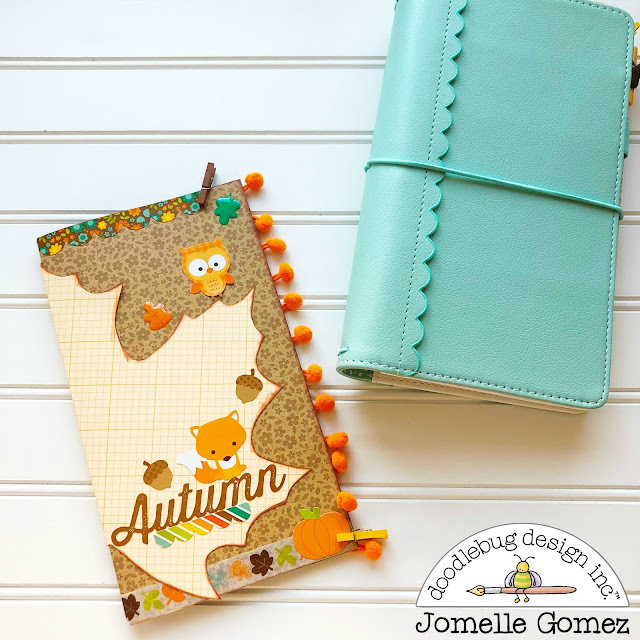 I would have never thought that the mint Daily Doodles Travel Planner will go well with the Fall theme, but now that it's all put together the colors match perfectly. I wanted to experiment with the sequins. I placed coordinating color sequins on a 3m laminating sheet and I laminated it. I cut it into the size of the standard insert and layered it on top of the insert that I had just created. Since the sequins were randomly placed, it was a little bit challenging for me to match it to the insert so that it will not cover the stickers that I used to decorate. It worked out well at the end. It was also a challenge to photograph it without the glare of the light. November is another month that is very special to me since it's my daughter's birthday month. She is turning 3 years old on November 27. I used the bon bon teensy type alpha stickers to add the Month. Noticed how the letter "R" is in upper case? Well, as I was adding the letters and I got to the "R" I noticed that I ran out of the lower case "r" I used the upper case instead. It looks just as good. 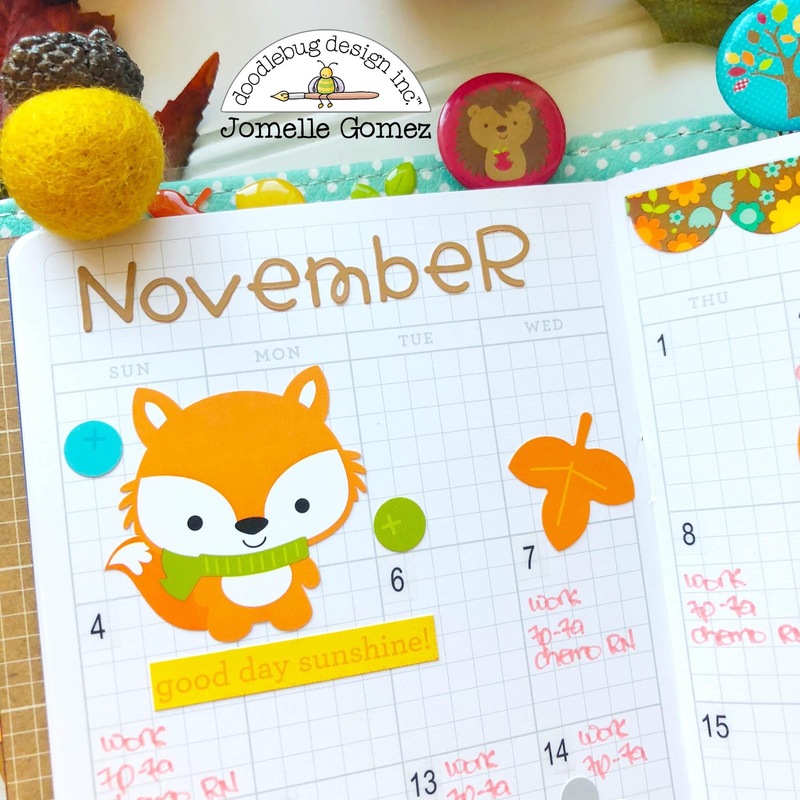 I used the "Fall Friends" icon stickers to create my layout. I bought this sticker when I went to Doodlebug Headquarter last month. Another cool thing about attending that event was that I was able to purchase some "vintage" stickers, papers and more. When I saw the little fall critters, I knew I had to use it for my petite prints project. We haven't decided what we're doing for my daughter's 3rd Birthday. We took her to a Disney character breakfast at Goofy's kitchen last year since she loves Mickey Mouse. Last year we also went on a mini vacay to Moab ,Utah to see the arches the week before her birthday. This year we're hoping to go to Iceland to see the Northern Lights. I created another page to add to my set up by using one of the 12x12 cardstock paper from the Flea Market Collection. I cut it to the size of my standard insert and I made sure that the image sits right in the middle. I then added a vellum on the bottom and glued just the corner edges to create a pocket. 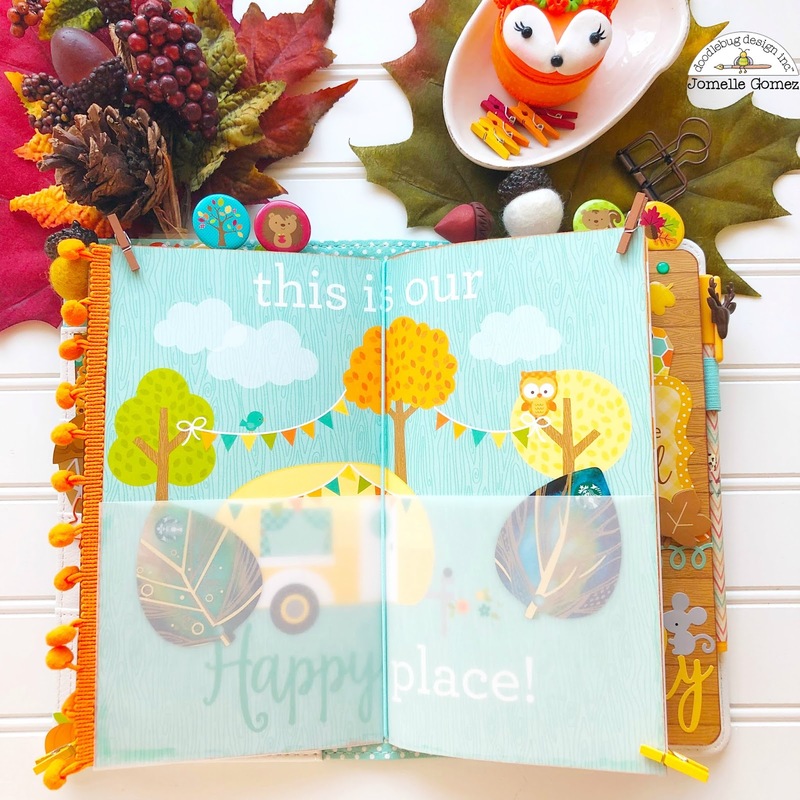 This can hold stickers, pictures and other embellishments. You can see how the I placed the leaf gift card in the pocket I had created. I also found these doodads at Doodlebug Headquarter. It was in the "Last Items" bin and it was literally the last one left. 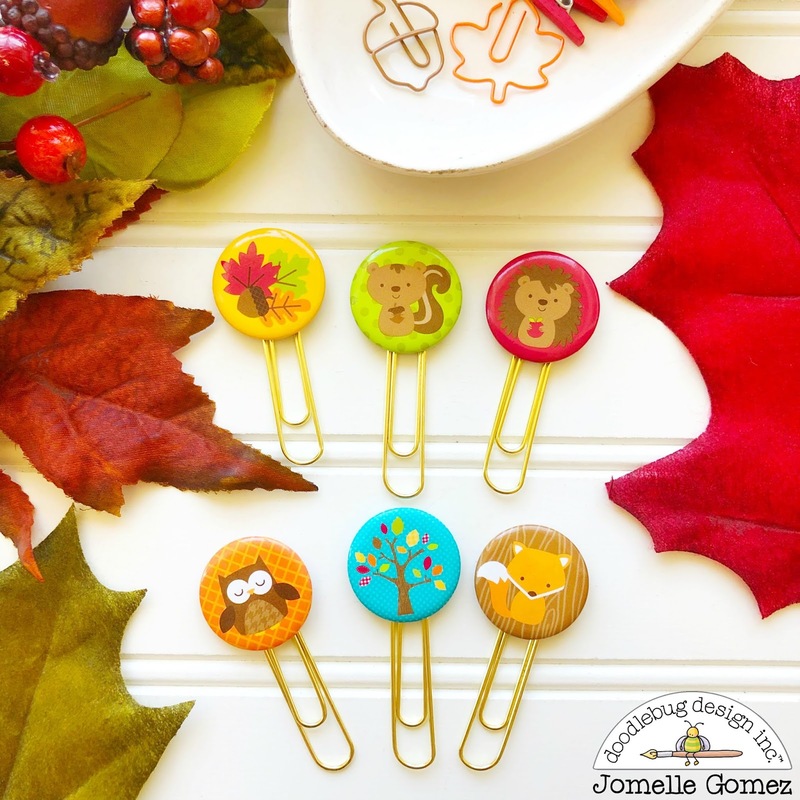 I turned them into cute paper clips. Are you as excited as me for Fall Season? My hubby would say "It's boots season" I finally get to wear my boots. Living in Southern California I don't get to wear my boots as often as I want to. 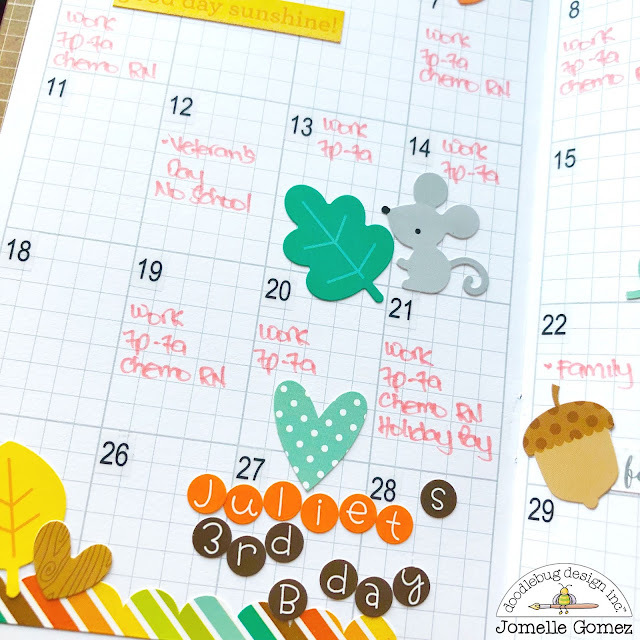 Thanks for stopping by and I hope you enjoyed and was inspired by my Fall Set Up in my Mint Daily Doodles Travel Planner. 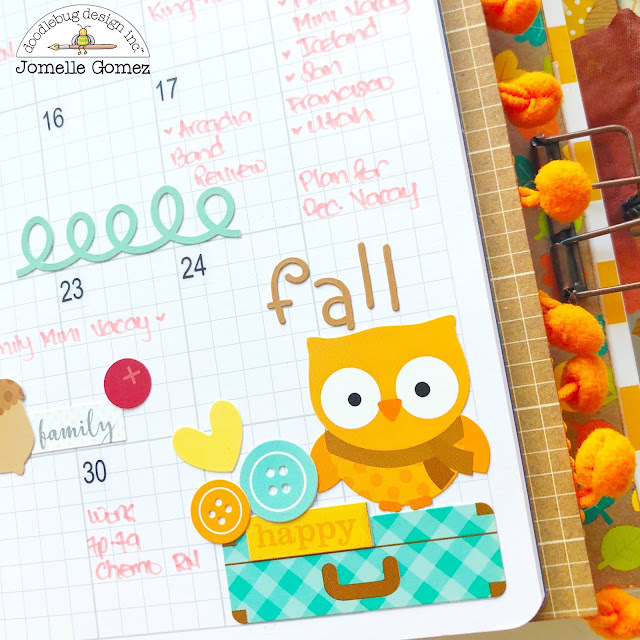 This is such an amazing fall planner spread!!! I love everything about it!! It makes me want to run and grab a pumpkin spice latte!!!! !